The Pebble Experience is an exciting new journey in fusing, utilizing Bullseye powders, chemical reactions and frit. This new jewelry line is like nothing ever seen and Tanya should know as she has spent the last year working tirelessly to develop this new technique. After viewing this webinar recording you will be able to make pieces with layer upon layer of floating pebbles with individual color reactions throughout! If jewelry isn't your thing, don't worry! 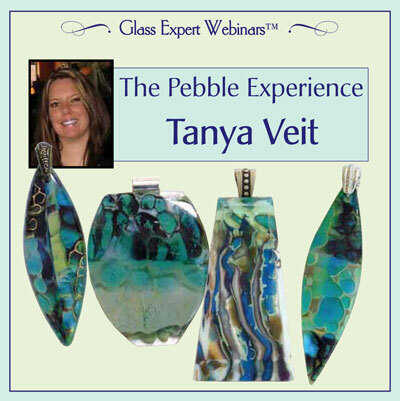 Watch as she demonstrates how to make attractive nestle bowls, and shares with you how she created her Pebble Tower---a 1/2 inch thick sculptural piece of glass with a look of floating ribbons and pebbles! Includes access to firing schedules and Tanya's recipes for these projects. This Dual Layer DVD will play on most DVD players.